Somehow it disturbs me to walk by my neighborhood fruit and vegetable stand, when the wintry winds are blowing, and to see bundles of scrawny asparagus displayed. Who wants to eat asparagus when your fingers freeze as you try to extract the several dollars that the overpriced asparagus will cost? I was raised to eat everything in season—in fact, that’s all we could get from our local groceries. Even though we moaned about being tired of oversized carrots and turnips, potatoes and rutabagas, to say nothing of large heads of frost-bitten cabbage, the long wait for spring only stirred the appetite for the good things to come and it made biting into the first spring asparagus all the more satisfying. Although my mother was of English background and very particular about table manners, we were taught that it was quite correct to pick up the stalks and eat them one by one down to the coarse end of the stem, even though melted butter or Hollandaise would be dripping from our chins. So I have always felt confident, almost defiant, about eating asparagus with my fingers wherever it is served—in fact, it’s a large part of the fun. 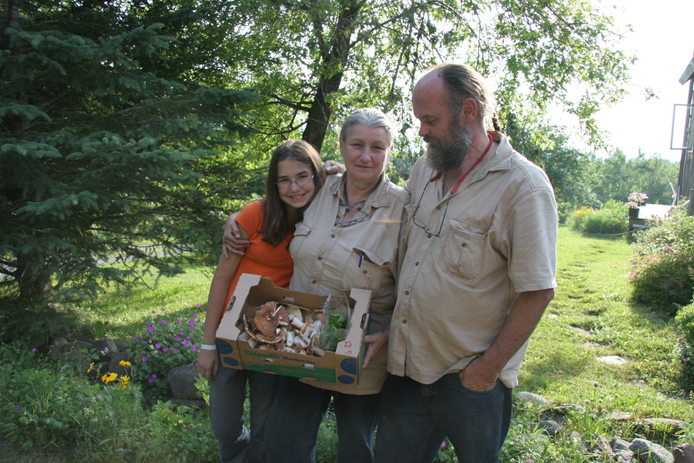 Thirty years ago when my husband Evan and I got our house on Stannard Mountain in the Northeast Kingdom of Vermont, one of the challenges for this city couple (flatlanders, the locals call us) was not only to start a garden but to get to know the land. We wanted to be able to forage for what the woods and meadows had to offer to enjoy every morsel from early summer to fall. Fortunately we met a wonderful woman, Adele Dawson, who used to give workshops on wild edibles and medicinal herbs (she was also a dowser), and she agreed to walk our land with us. As we wandered together over the terrain she would stir up leaves or poke through branches with her stick and point out the hidden treasures of early spring: milkweed shoots, fiddleheads, young dandelion leaves, wild garlic buds. Adele not only guided us in what to look for and where, but how to cook according to the time of year each item was harvested. For instance, the delicate spring milkweed shoots were best simply sautéed in a little butter or light olive oil; then in July, as soon as the milkweed developed purplish blossoms, the tight heads should be plucked and dipped in a beer batter, then fried until lightly browned and eaten with just a squirt of lemon; by late summer, the pods form and they are equally delicious—but different—stuffed and then steamed or deep-fried. I learned particularly to enjoy sorrel in a rich creamy soup or with eggs or as a tart accent to fish or fowl. I first encountered it as a weed that invaded a patch of heather we were trying to cultivate and I was ruthlessly pulling up the leaves and dumping then on the compost heap—that is, until Adele enlightened us. I’ve always been drawn to gooseberries, perhaps because they were a mystery fruit whose acquaintance I first made in Jane Austen’s Mansfield Park. I loved the sound of English puddings like Gooseberry Fool and Gooseberry Flummery. But the berries are hard to find these days even in farmers’ markets. We soon found out why. In our search for a couple of bushes to plant, we learned that during the Roosevelt years, it was discovered that gooseberries caused a pine blight so the President ordered his C.C.C. men all over the country to root them out. It has since been proven that the bushes were a threat only to the white pine and that if they were planted a sufficient distance away, there was no problem. But in the meantime America lost all its gooseberries, and we were intent on restoring them, at least on our hilltop. Our two bushes, along with one rhubarb plant, now give me plenty of delightfully tart accents not only for desserts but also for sauces and preserves. Once on a trip to Wales, stopping at country inns, we sampled for the first time mackerel served with a gooseberry sauce, as well as the more familiar salmon with sorrel sauce. These—gooseberries and sorrel and rhubarb—are the lemons of the north, I thought to myself. I realized that in northern Europe and the British Isles, where lemons were once a rarity, they have long contributed essential acidic flavor to many a savory dish. In fact, it is ingredients like these that give regional character to our cooking—something we don’t want to lose by eating asparagus from South America in the middle of December. Several years after our introduction to Adele I got to know Nova Kim and Les Hook, naturalists who seemed to be born with the gift of knowing the secrets of the earth. They have now developed a following among food lovers and chefs in Vermont, supplying them with local wild treats from early summer through fall. They bring me generous samples of the wild mushrooms they seek out and gather—morels in late spring, chanterelles all summer long, boletus and hen-of-the-woods in fall, as well as many others. And I’ve learned to recognize one or two species on my own. There is nothing more exhilarating than spotting a patch of chanterelles thrusting their golden heads up through the soil at the edge of our woods and then bringing them home and cooking up a feast. As I write this I have been snow-bound for several days in northern Vermont where I was scheduled to talk about my new book in a few of the independent bookstores up here. Fortunately my niece Sally and her husband Tony, whose house is not as inaccessible as mine in a blizzard, have given me food and shelter. A little while ago Tony had an inspiration: why not salvage the rest of the lettuce still in cold frames in his vegetable garden? Insulated by the snow, some of the leaves had survived, last time he checked. So we headed out, bundled in down coats and boots and scarves, with a below-zero wind whipping us, and we managed to scoop up the last of the tiny damp leaves—only a handful after they had been cleaned. But they added considerable sparkle to our salad that night and it was a loving way of celebrating the end of late fall, moving into winter.